'How to Self-Publish a Book on CreateSpace & Amazon' is a book that talks the reader through the self-publishing process on Amazon and CreateSpace. The book shows you how to publish and distribute your own work in print and Kindle eBook format. It also contains sound advice on pricing and how much money you are likely to make by selling your book. You can learn more by reading the about the book section on this page. The book is available in print and Kindle format from Amazon. Links to the book's product pages can be found below. You can no longer buy books directly from CreateSpace - this change occured at the end of October / beginning of November 2017. This is because CreateSpace is becoming increasingly integrated into Amazon's platform. The book is sold very cheaply as it was not written with profit in mind. So Kindle eBook prices start from £0.99 / $0.99 and print copies start from as little as £4.20 / $6.00 (depending on current exchange rates). As mentioned above, you can no longer buy the book directly from CreateSpace. The book shows you clearly how to self-publish using CreateSpace, an Amazon owned company. 'How to Self-Publish a Book on CreateSpace & Amazon' contains many screenshots of the self-publishing process, accompanied by lots of practical advice based on years of hands-on experience with publishing books. The book was originally written as a blog post for Matthew Woodward's blog. 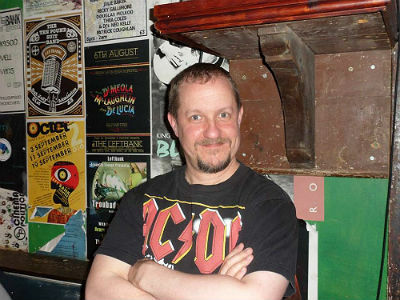 Matthew runs an award winning internet marketing blog that gives lots of free advice, much like I do with my website. Because of this, I approached Matthew about writing a post for his website. Originally, I suggested writing about how I had grown the audience on my website and then decided to give up work to try and make a living from my blog. Given my background with writing short stories and self-publishing, Matthew asked me to write about how to self-publish a book on CreateSpace and Amazon instead. So I did. To write about the self-publishing process accurately, making sure I didn't leave anything out, I had to produce a book. So I decided to make the post I was writing into a book as a live example, clearly showing how easy it is to self-publish. Hence the book was born. The book is priced cheaply as it was not originally written with profit in mind. The vast majority of the content is available to read for free on Matthew's blog, so it seems unreasonable to charge a lot of money for it. You can read the book for free on Matthew Woodward's website. The printed and Kindle version exist so the reader can clearly see how the post was converted into the format for a printed and Kindle book. It also allowed me to show pricing, distribution and royalty options using a real-life example. I run this website and have many years' experience of self-publishing my books and selling them through Amazon and CreateSpace. I wrote my first book, Wicked Game, in 2010 and self-published it using Lulu for print and Amazon KDP for eBooks. I run the To Hull & Back annual humorous short story competition. Every year, I use CreateSpace and Amazon KDP to create and publish the anthology. I also used Amazon KDP and CreateSpace to publish my book How to Write a Short Story, Get Published & Make Money which was released in 2015 after undertaking years of extensive research. You can learn lots more about me in the About section of this website. Very useful tips, thanks Chris - have saved for future ref for when I do my short story collection. Thank you, Chris. Matthew's blog read with interest. I don't think my fiction attempts are worth publishing but I may launch a few poems at one of the suggested outlets some time. At present though, I'm up to my eyes with articles for various magazines. Got to get bread somehow. Dear Chris, for me the biggest hurdle to publishing on Amazon is reading, understanding, and adhering to their terms of service. It is incomprehensible. I, for one, refuse to participate because of their insistence of my signing that stupid contract. I don't know how they expect ordinary mortals to sign it, but lots of people do. I think anything to do with selling comes with complex Terms and Conditions, Terms of Service, Copyright (lots of people seem to worry unnecessarily about that), Publication Rights etc. now-a-days. It’s the world of the internet and the ever growing distribution channels it offers. I understand what you mean, but I rarely let legalese put me off doing something I want to do – I just get on with it. If Amazon don’t like anything I do, I hope they’d tell me and then I can simply stop doing it. Christopher, you have a wild and wonderfully unbridled attitude toward the law! I never thought of it could be done that way. I always read every line of every small print before I sign on the dotted line. Oh, how I wish I could be like you. And come to seriously think of it... 'tis not too late at all for me to assume your attitude. Thanks for teaching me... a life skill, more than just how to publish on Amazon. Really... the beauty of your solution's simplicity is staggering. Why put the onus "to behave" on myself, when the other party has the vested interest in my "behaving" or "misbehaving"? Let them worry about it. 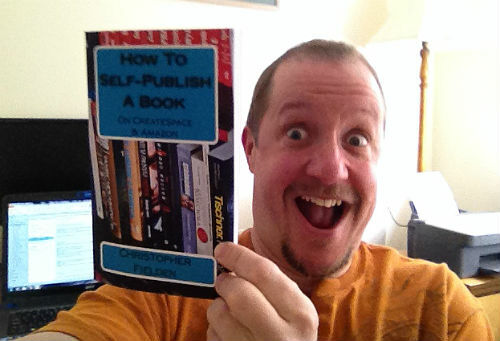 Hi Chris, just reread your How to Publish on CreateSpace, RAD. When I'm ready I'll get your book and do it. I'm a tech peasant so it's gonna take a minute but it looks like fun. I'm guessing with all these short stories I'll have to rewrite them as one document. Hmmm, maybe I'll hit up an exgirlfriend to help... hmm… birth of a bad idea. Any how, it's good to know this is available. I still have one more story to submit for the To Hull & Back competition. Until then, appreciate ya. Hi Chris. I was inspired by your "how to guide" and writing tips. Tales of the Unaccepted is now available from Amazon. Hi Christopher, I've read your post on Matthew Woodward's blog about how to self-publish on Amazon, and will be reading more of your work, but I had a quick query. If I publish a physical book in the way you explain, can you buy numerous books at less than the price you set to give away to family/friends? I understand that you can order proof copies, but if I didn't order enough of these, can I buy more cheaply or do I have to buy them at full price? Thank you for your wonderfully informative post. Hi Tegan. Thanks for reading my post – I hope you found it helpful. Once you've published your book, you can buy as many (or as few) copies as you want from CreateSpace. When you buy them yourself, they are much cheaper as you don’t have to pay any royalty fees to Amazon. If you buy in bulk, it also saves on postage costs. In CreateSpace, just click on 'Order Copies' in your member dashboard. From there, you can buy your books. I hope that answers the question. I wish you the best of luck with publishing your book.